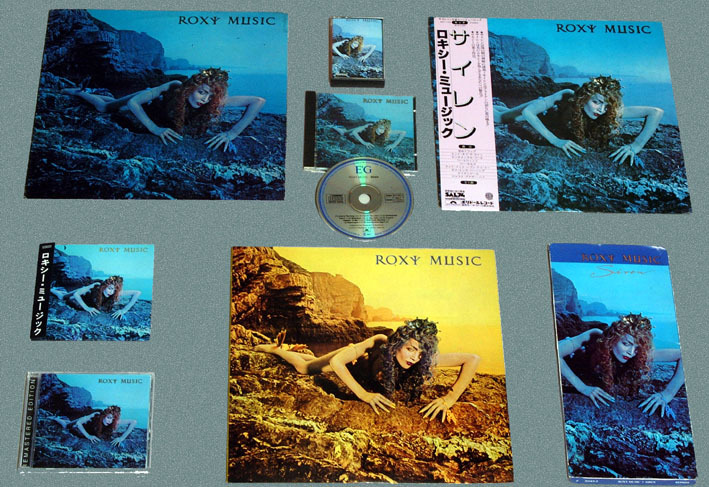 Roxy Music's fifth album was released on 31st October 1975 and reached number 4 in the UK charts. Fans got to hear previews of the album as the UK tour began in Preston a month before the album release. The first release was one of their most successful singles 'Love Is The Drug' c/w 'Sultanesque' released on 29th September 1975. The single reached number 2 in the UK and was kept off the top spot by David Bowie's re-release of Space Oddity. Both Ends Burning was released as a follow up single and peaked at number 25. Roxy decided to disband indefinitely after this album allowing each core member to pursue solo interests. This album saw for the first time the co-songwriting of Eddie Jobson on She Sells. Video documentary about the making of the album sleeve. Bryan Ferry's sleeve concept was of a Siren like figure clambering across a rocky shore. The original concept was to have a sci-fi like background and Sizewell B nuclear power station was penciled in as a possible back ground to shoot the cover. Bryan eventually settled on the idea of a rocky coast with waves crashing against the cliffs in the background. After seeing a TV documentary about lava flows that included some footage at the cliffs at South Stack Lighthouse near Holyhead in Wales fashion designer Antony Price headed to the location to check it out and it was decided this was the place. He designed the costume for the sleeve in a green colour to match the colour of the sea and the vegetation on the cliffs. One week later Bryan, Antony,Jerry and the crew headed to the location to do the photos. They arrived one afternoon in August 1975 and headed down to the location to have another look before the photo shoot the next day. When they arrived they saw that the scene had changed in colour due to the calmness of the sea and the strong sun. It was decided the shot would be done in blue and they had to paint Jerry's costume that evening. A handful of copies where pressed in green to see how it would have looked and this is one of the rarest Roxy collectible items. "I think," says Ferry, "that it is the best album we've done. It has the energy of the first two and the professionalism of the last two. The advantage of making a lot of albums is that you acquire the expertise to make each new one sound more and more professional. In the end though, you get problems of knowing how much to put on each track. For Country Life we used a 24 - track studio, this time we used a 16-track. Everyone now is keen to play on every track so there has to be a certain amount of discipline. There comes a time when you have to say diplomatically what you want to add on would be very nice, but it might detract from what's already there'." Sultanesque A Bryan Ferry instrumental composition used as the b-side to Love Is The Drug. Love Is The Drug (Rollo & Sister Bliss Mix) This track was re-mixed and back in the UK charts in 1996. Both Ends Burning (Single Version) The second single for the album had a shorter edit.